Flight Centre are Australasia’s most successful and innovative travel agency group. As part of a branch refurbishment program they were looking to partner with a similarly successful and focussed Digital Signage supplier able to provide sophisticated and flexible installations. They chose Hewlett Packard and their preferred DS software package, NZ’s Wallflower. HP provided a complete turnkey solution including supply of hardware, software and services. The majority of Flight Centre branches have a similar installation consisting of a 2X2 video wall of 47 inch screens with a portrait format display in the window. 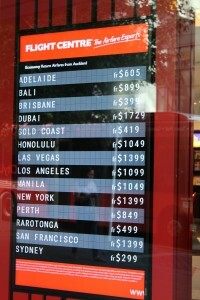 For the flagship Queen Street store in Auckland two video walls were installed with two window displays. One of them a 70 inch screen and 1 a 47 inch. 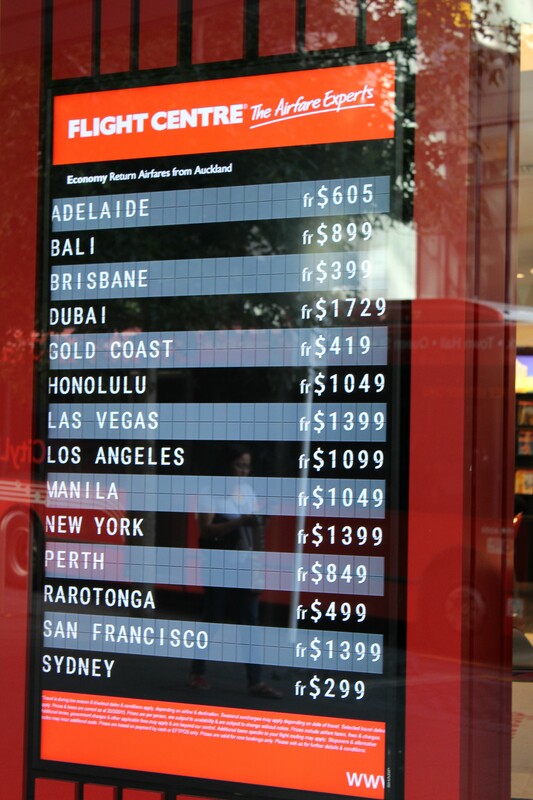 Commencing in November 2014 the digital signage network is progressively being rolled out throughout New Zealand. Hewlett Packard MP9 media players are used to drive the screens using Wallflower’s unique ability to drive multiple displays from one player each of which can be scheduled independently. This feature provides a very cost-effective solution in terms of hardware and software costs. Flight Centre Head Office is able to remotely manage all the displays and control the media displayed on them. One very inventive feature is the window displays showing current fare offers in the style of an airport ‘ticker’ flight advisory board. The effect is uncannily similar to actual airport boards and is a dramatic eyecatcher. The aim of many digital signage networks is to become a destination that visitors look to for the latest current information. With its real-time updating ability the Flight Centre windows deliver this. 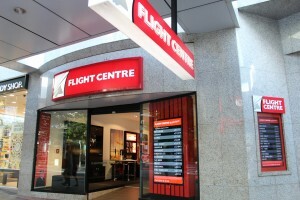 Flight Centre (NZ) Ltd is New Zealand’s largest travel agency, with approximately 900 staff in more than 200 retail stores and businesses nationwide. Flight Centre consultants are the travel experts and are selected for their vast product knowledge and their passion for travel. Flight Centre’s global network allows consultants access to the widest travel product offering in New Zealand, at the best value. The company has won the Kenexa Best Workplaces, large workplace category award for eight consecutive years. In addition and in recognition of Flight Centre’s continued achievements in the Kenexa Best Workplaces Survey over the past ten years, Flight Centre is also a Five-Year League Award recipient and a Ten-Year League Award recipient. Flight Centre Limited globally has almost 13,000 staff in 11 countries including Australia, New Zealand, the United States, Canada, the United Kingdom, South Africa, Hong Kong, India, China, Singapore and Dubai.